Electric Voice Records' previous compilations have exhibited a penchant for all things eccentric and experimental, so it's only appropriate that the Halifax label is defying convention with its latest release. 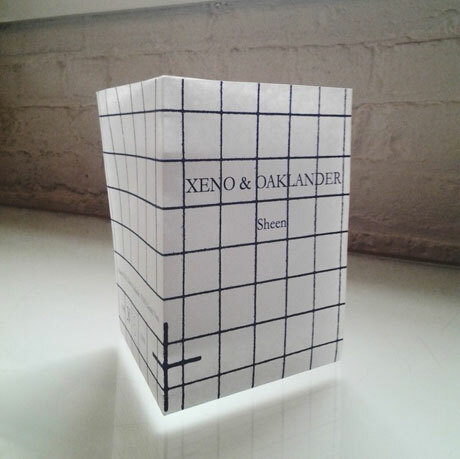 Minimal synth duo Xeno & Oaklander are preparing to release the new single "Sheen" via the imprint on May 15, and it will be available as a limited downloadable accompaniment to a pocket-sized pamphlet. The label explains, "As we progress in a time where the Internet has become the main tool for general retail and as digital music sales increase, we take pride in maintaining our purist roots and analog formatting ideals. To integrate the digital download purchase into a tangible collector's item — we have created a bridge between the digital and physical retail world. We will objectify the digital download purchase through a series of formats with accompanying download code with intentions of your download code becoming a collector's item." The first of such Electric Voice releases is that of Xeno & Oaklander. The artwork for the single was created by the band's own Liz Wendelbo and it is available in a run of 2,000. The band said in a statement, "I love pamphlets, the format fits in the pocket — you can keep it close to you. I thought that for our single, 'Sheen,' it would be fitting for the digital release to be a pamphlet — an object, something you can collect. You can hold it, prop it on your shelf, and frame it if you want. It becomes a poster too when you unfold it. I like the fact that it's silk-screened, each one is different, and the hand leaves its mark. It's a desirable object, and it's very minimal." The pamphlet is available to pre-order here. For those only interested in the song, it can be pre-ordered as a stand-alone download from iTunes. The single be will followed by a more traditional release, as "Sheen" will reappear on the six-song Par Avion EP. It's due out this fall in digital and vinyl formats. Xeno & Oaklander will be touring Europe this spring. See the itinerary here.